This Trompe L’Oeil painting has everything you need to be a cowboy (or cowgirl). First, you have your fringed shirt with a sheriff’s badge. 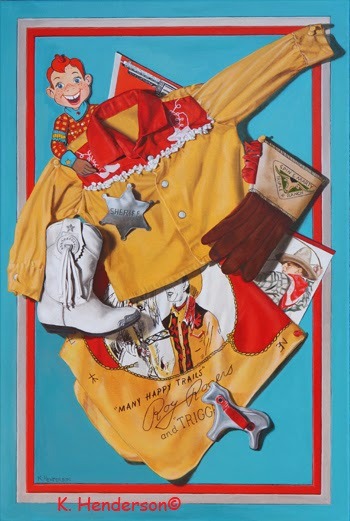 Add your boots, gloves and a scarf signed by the King of the Cowboys, Roy Rogers. You can’t go anywhere without your horse,your six shooter and favorite Dime Novel. Take along your pardner, Howdy Doody, and you’re ready to hit the trail. Yee Haw! 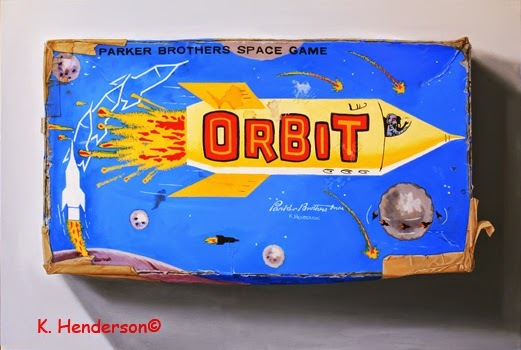 Here’s my latest Trompe L’oeil painting in my Vintage Board Game series. 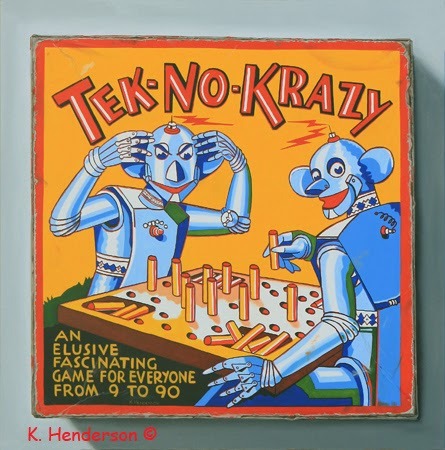 This game was manufactured by Parker Brothers in 1959. 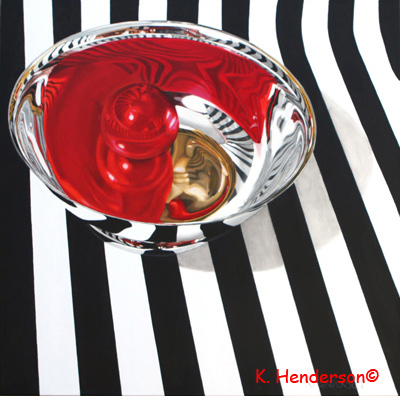 Stripes and silver and red: My favorites! I’ve been working on this painting, off and on, for a while now and I’m pleased with the results. The still life had a brass goblet which you don’t see. The gold reflections still remain in the bowl adding additional color and design. I love old books! I buy them at library book sales, thrift stores, get them as gifts or pick then up where ever I can find them. I love them in pristine condition or old and torn. This book, The Flyers by George Barr McCutcheon, was published in 1907 and was read by many at the Muskogee, OK, Public Library before it was retired and purchased by me about 15 years ago. Don’t you love the little portrait on the cover? It’s a separate print pasted to the blue, embossed cloth cover. 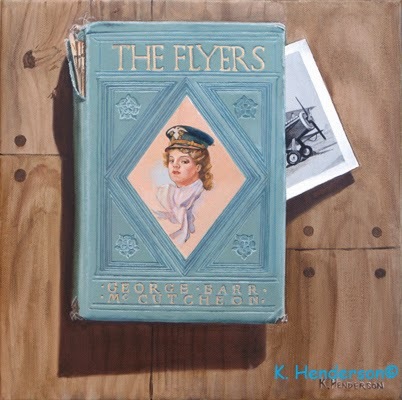 This Trompe L’oeil is from my series of Flight Themed paintings. I’ve created a similar painting to this and I enjoyed painting it so I decided to revisit the subject. These are some vintage toys from my collection. Wooden Blocks, spinning tops, playing cards, chess, and marbles are all toys or games that have been played with by many generations of children. Yes, I know these are Honey Bees and not Bumble Bees but I like the title. And it fits in my my current Flight Themed paintings. 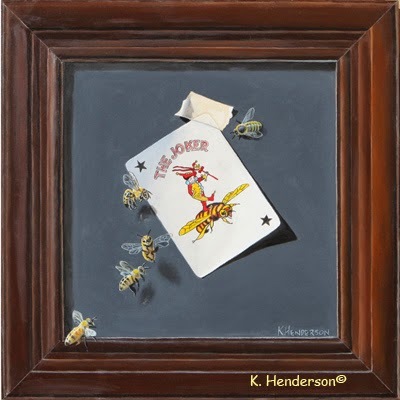 My favorite playing cards are the Jokers because they are so varied and this one with the bee is one of my favorites. 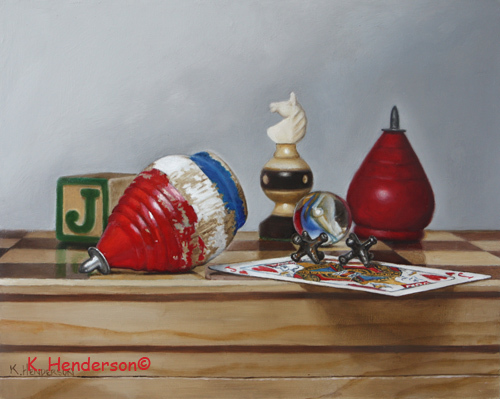 This Trompe L’oeil painting is all about ‘Having a wonderful Time, wish you were here’. 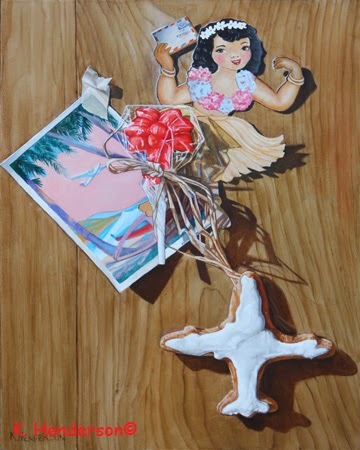 A hula girl, postcard of a tropical beach, a candy palm tree and a cookie airplane all sum up that summer holiday. Ace 92, 12 x 12, oil on cradled board. This is another card Trompe L’Oeil painting. It has the Ace of Spades from the Bee Brand deck of cards with bumble bees. I came across this Felix the Cat Crayon Box while engaged in my never ending search for vintage toys. The colors of the box and the pencils screamed out “Paint Me!” so I did. I don’t know if any of the pencils are original to the box but I don’t really care. 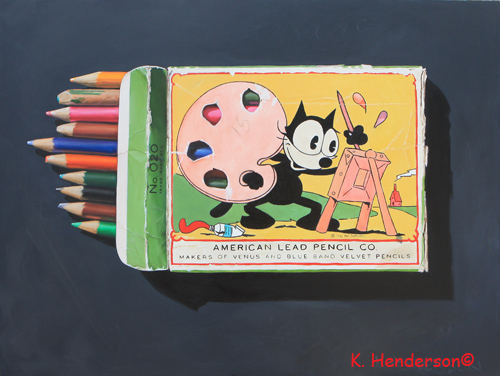 This Trompe L’oeil shows a box of colored pencils manufactured by the American Lead Pencil Company. These were called School Crayon Boxes although these are obviously pencils. Felix the Cat is painting up a storm!